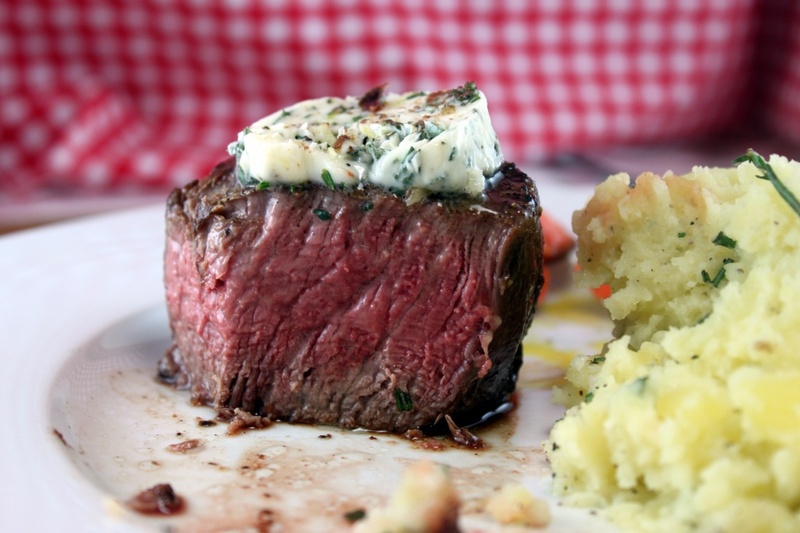 Treat your man to a hearty seared piece of prime beef and some savory mashed potatoes and he will be putty in your hands 🙂 Try this juicy filet mignon recipe and achieve perfect results every time! 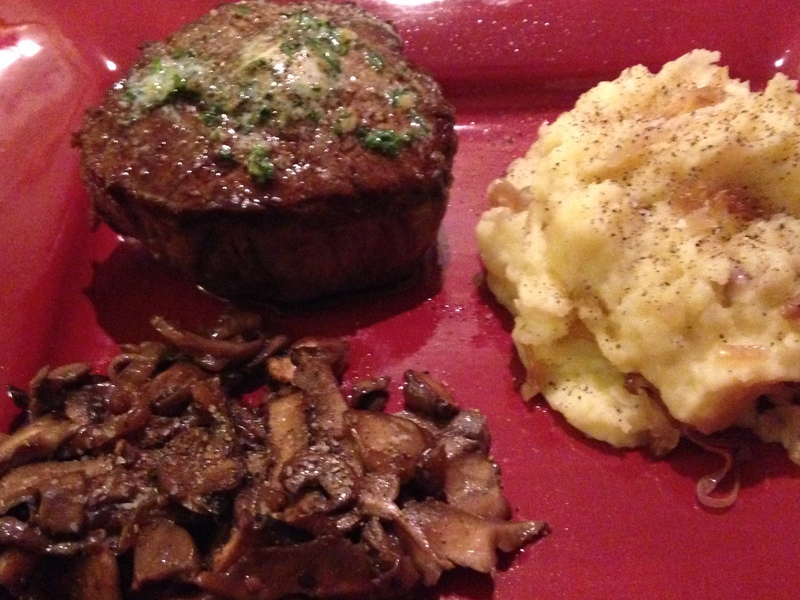 To complete this meal, I prepared Mashed Potatoes with Carmelized Shallots (recipe follows), sauteed Mushrooms, and a Caesar Salad with Pancetta. 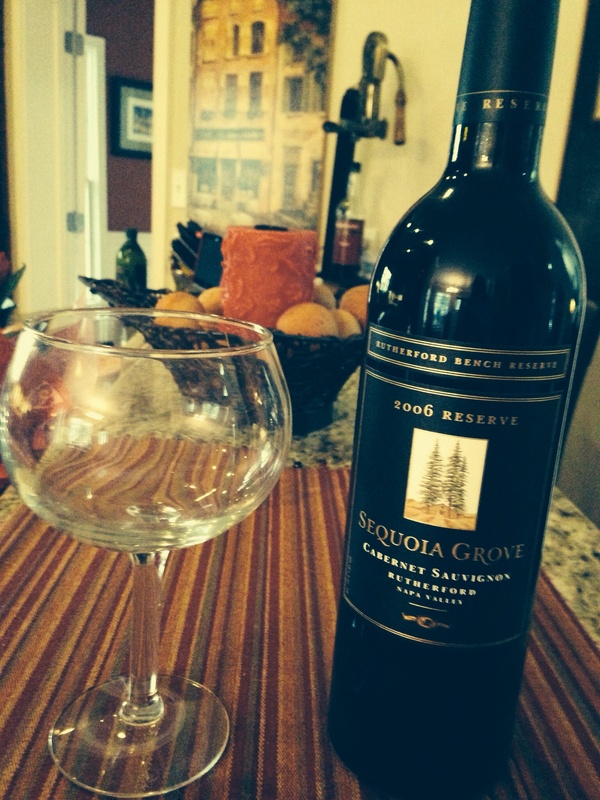 I first encountered this recipe a couple of years ago on a blog called “Whit’s Amuse Bouche”. Jeff is the griller in the family and is known for his amazing steak dishes. They are so good that I usually never even order steak in a restaurant because I know it won’t hold a candle to his flavorful beef no matter what the cut! Therefore, I never have a chance to cook steak for him so when I saw this recipe, I thought “I can do this!” And so can you! 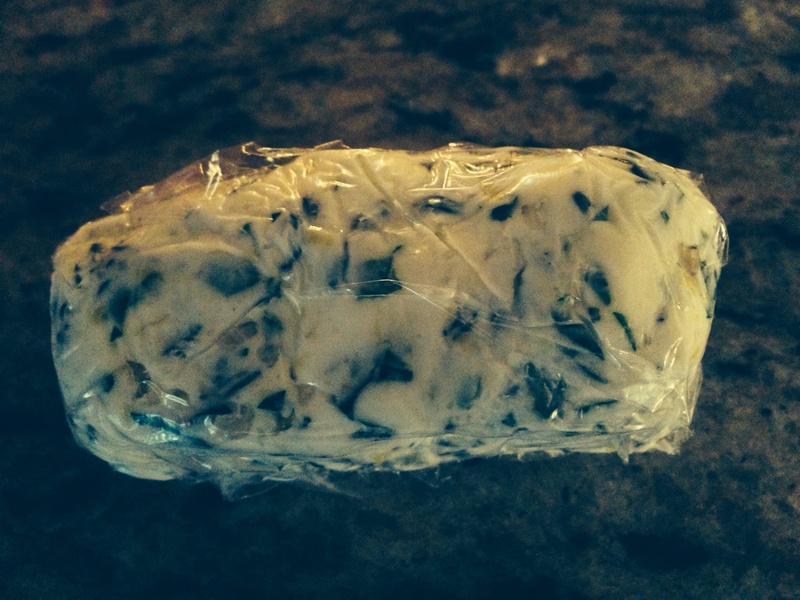 Take 1/2 stick of butter, softened, and mix well with the chopped garlic, the chopped herbs, and the lemon zest. Form into a log, wrap in plastic wrap and refrigerate. 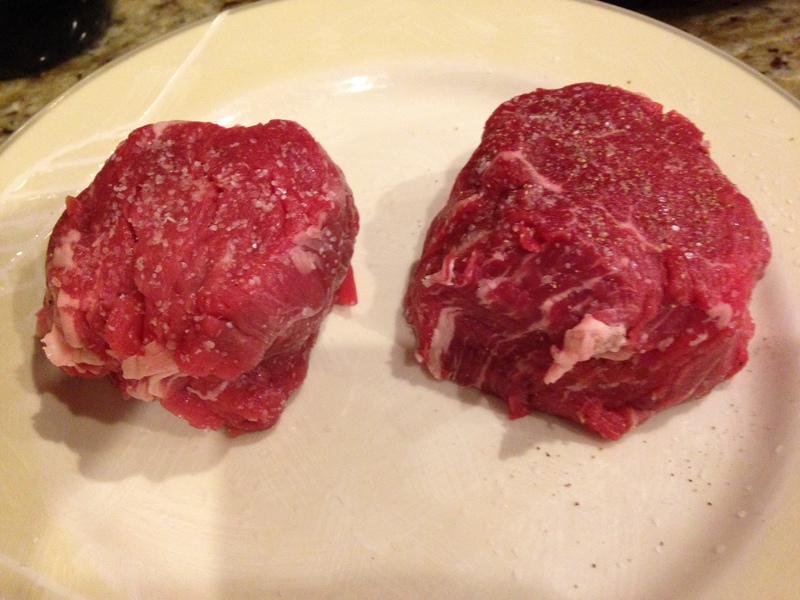 Generously season the filets with salt and pepper, approximately 1 teaspoon of seasoning per side. 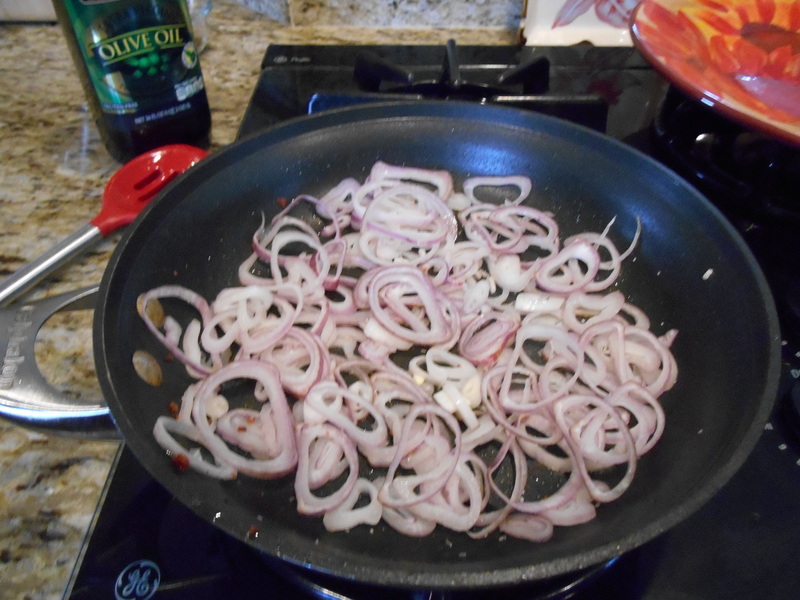 Heat the remainder of the butter (1/2 stick) and the olive oil in a cast iron skillet to a screaming hot temperature. Preheat your oven to 400ºF. 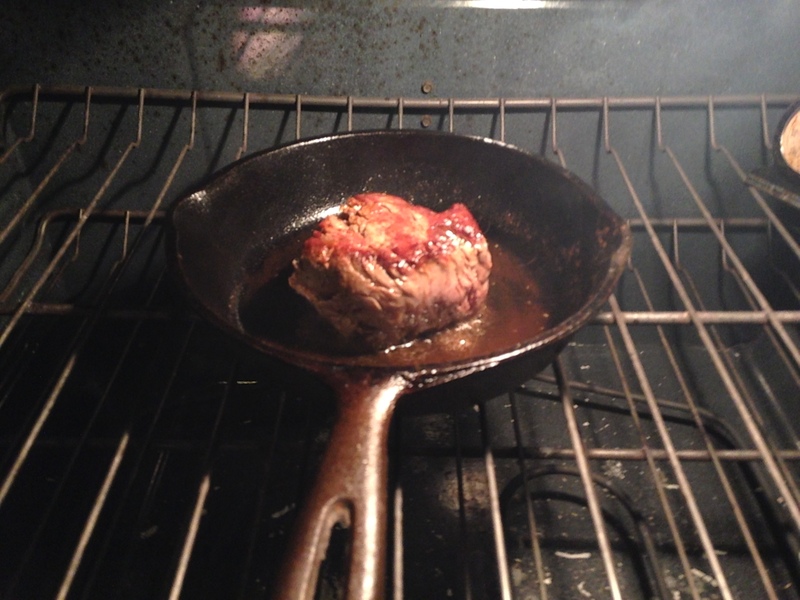 Sear the filets in the screaming hot pan for about 2-3 minutes per side, or until a nice brown crust has formed. 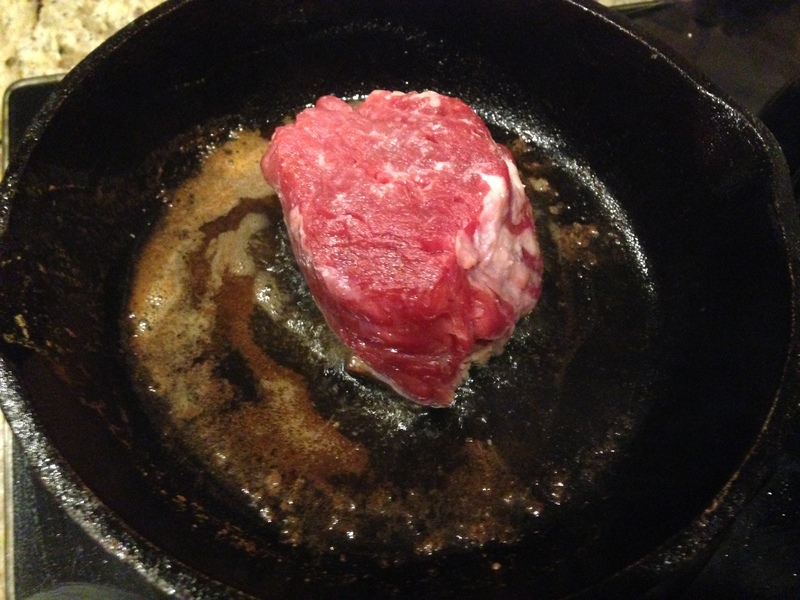 While the steak is searing, continue to spoon the residual butter in the pan on top of the meat while it’s cooking. 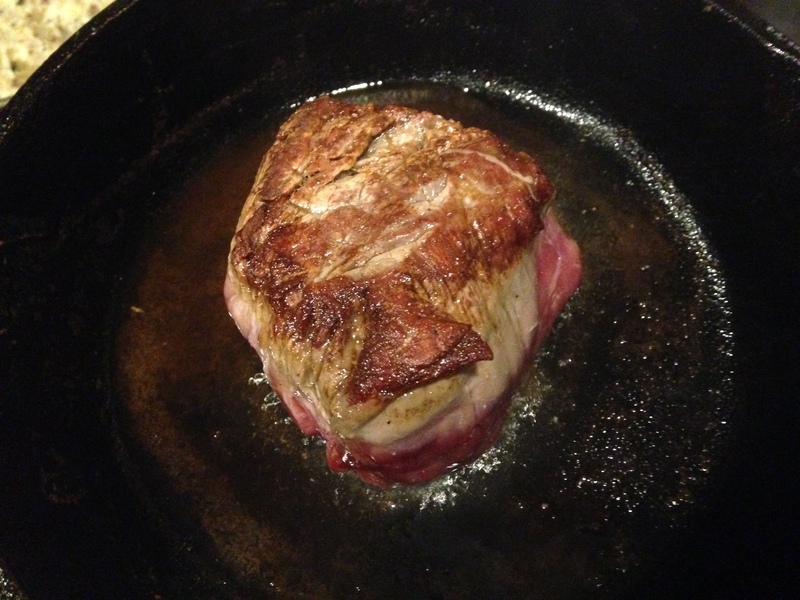 Once both sides are seared, place in the center of the oven for about 7-8 minutes, depending upon how thick your steak is. In the last minute of cooking, take the log of compound butter and slice a nice thick piece to place on top. Your steak will be ready when it is approximately 135ºF in the center, or when you push lightly on the top center of the steak and it gently and slowly bounces back. (Now while this temperature is perfect for Jeff, I like mine more done so I typically use two small cast iron skillets and put mine into the oven first. You could also use one skillet and take the rarest out to rest while the other one continues to rest. To achieve a medium well with a warm pink center, I kept mine in for a total of 10-11 minutes, again this is based on how thick your steaks are). 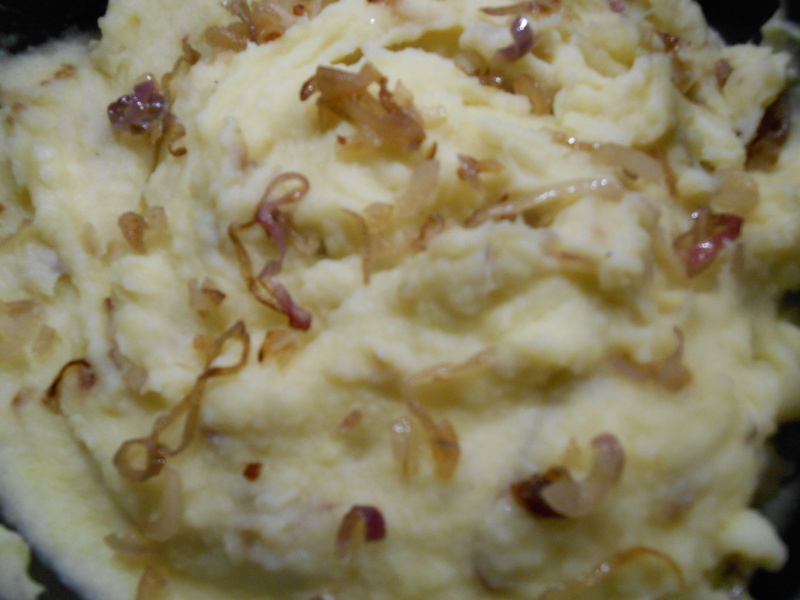 Just when you didn’t think this meal could get any better, it does with Mashed Potatoes with Carmelized Shallots by Fine Cooking Magazine. 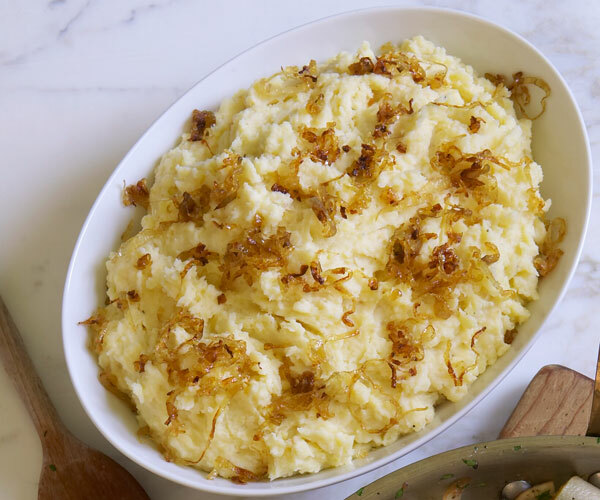 This is not your every day mashed potato dish…from the first bite you want to close your eyes and savor the rich creamy flavor. I know you will enjoy this one! Heat the oil in a 12-inch skillet over medium heat. 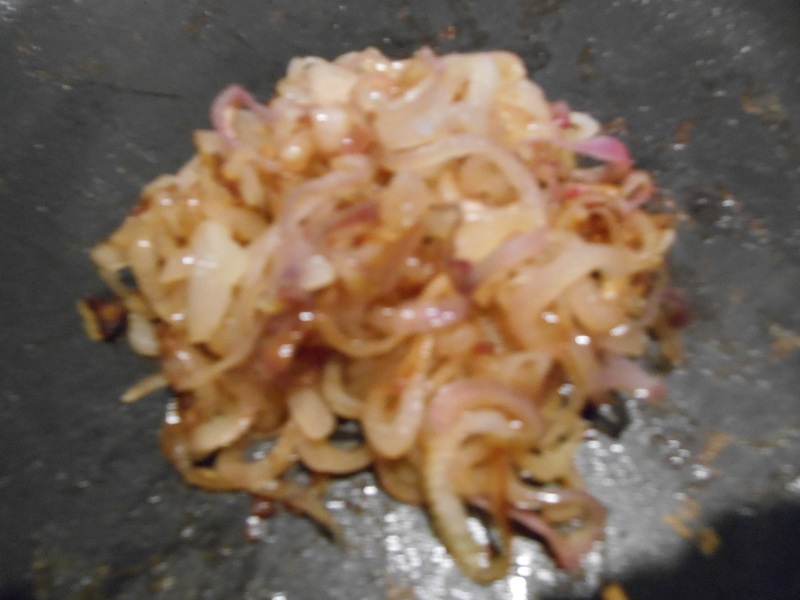 Reduce to medium low and add the shallots and 1/2 tsp. salt. Cook slowly, stirring occasionally, until soft and golden, 15 to 20 minutes. Put the potatoes in an 8-quart pot and add enough water to cover by about 2 inches. Add 1/4 cup of salt. Cover the pot and bring to a boil over high heat. 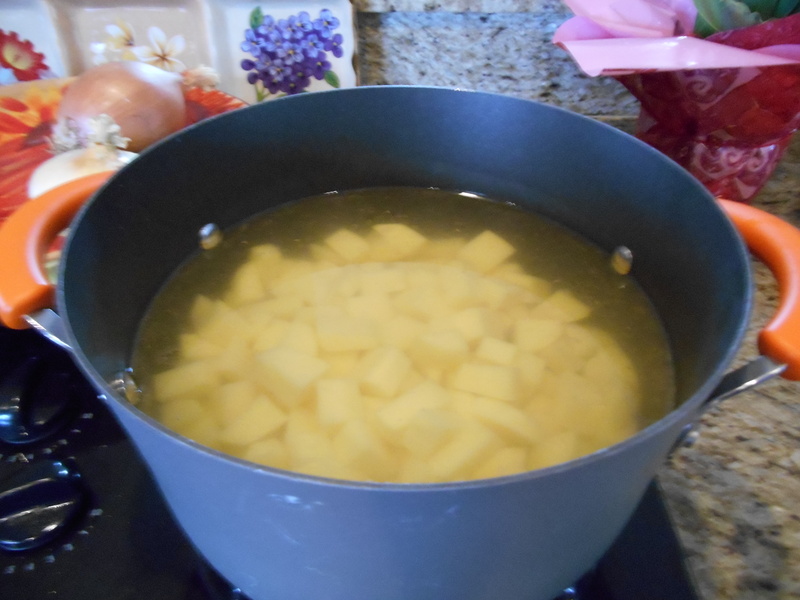 Reduce to medium low and simmer, uncovered, until the potatoes are tender, about 20 minutes. Drain, return to the pot, and stir gently over low heat to dry them. Dump the potatoes into a bowl and then pass through a ricer or food mill back into the pot. (This is a food ricer that I bought from Williams Sonoma a couple of years ago and I love it! 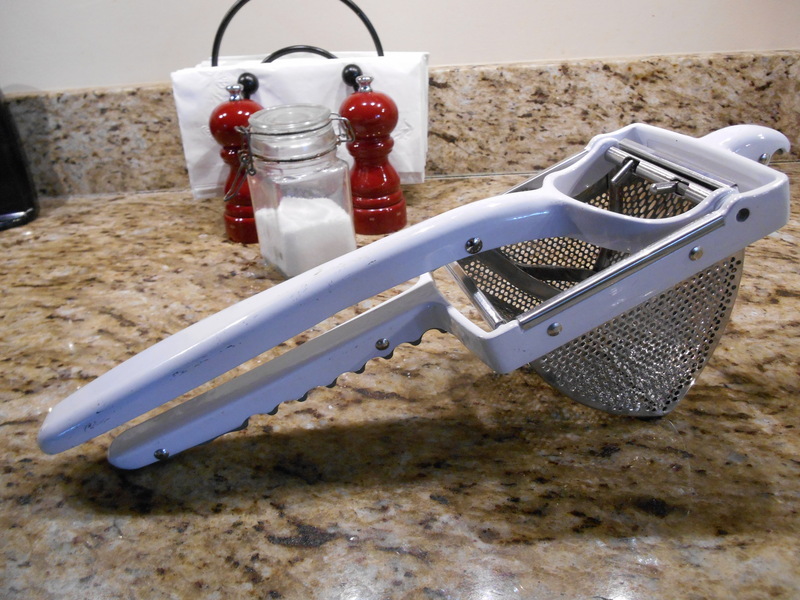 If you don’t have one, you can mash with a potato masher in the pan or use an immersion blender). Whisk in the melted butter, creme fraiche (I got this at the Fresh Market but you could easily use sour cream), and milk, adding more milk as needed to reach your desired consistency. Bottom Line: I love this steak and you can play with the seasonings and compound butter to create any flavor you want. It does create a smoky kitchen so have your fan stove top fan going and light some candles! 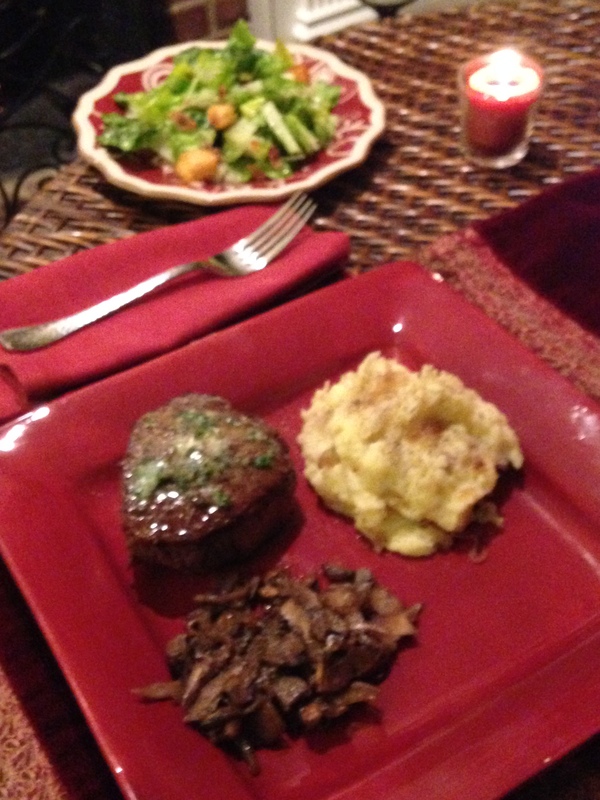 FYI…Jeff’s grilled steaks are still my favorite of all but he loves this and it was absolutely delicious! ← Beefy Vegetable Soup..Perfect for Winter Storm Pax!